“Like the ancient art of couch burning (but far safer), flat-naming is a very important and unique part of the overall rite of passage of Otago University students.” So say the authors ofScarfie Flats of Dunedin. Sarah Gallagher was so intrigued by this vibrant aspect of Dunedin’s social history that she spent 18 years researching it before co-writing a lavishly illustrated book on the subject with Ian Chapman. The two will share stories about the flats, the tenants and the colourful goings-on. Chaired by upstanding former Castle St resident (and author of one of the book’s chapters) Aaron Hawkins. New Athenaeum Theatre 10pm on 28, 29, 30 March, book here. Thanks to the many people who have got in touch re this opinion piece I wrote about Michael Jackson’s place in academic study, published in the Otago Daily Times this week. It sparked heaps of support, and also a handful of folks with alternate views. Please note: I didn't write the headline - that was supplied by the newspaper. Personally I’d have titled it with something a bit stronger than ‘character flaws’, but nevertheless I appreciate the ODT’s willingness to publish. Otago Daily Times, 13 March 2019. The topic was also discussed on The Panel. Scarfie Flats of Dunedin - published! This book, written with Sarah Gallagher of Dunedin Flat Names Project, has been published and is now available in Paper Plus and independent bookshops. University Bookshop will post internationally. Read an extract in published in the Otago Daily Times, Tracing origins of Student flats. I'm pretty thrilled to have been invited to write this piece for Warner Music Australia, for their I Like Your Old Stuff website. Thanks especially to Rachael Botur and Allison Hodge for the opportunity. “Rock music has been a defining force in Dr Ian Chapman’s life as a musician, performer and academic. It is also the inspiration for his flourishing career as a writer.” Read the full article in Otago Magazine. The Bowie paper is back! Back by popular demand for 2019 is this paper dedicated in its entirety to David Bowie. An in depth and highly interdisciplinary examination and celebration of the artist’s work, it was a blast when I last ran it as a Summer School paper in 2015 and I’m excited to be running it again in a new and improved format. 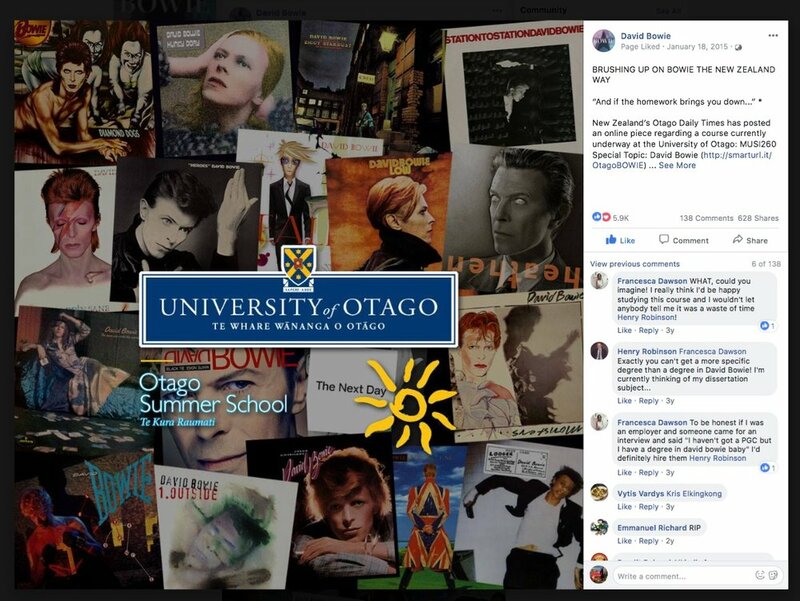 It came to the attention of Mr Bowie himself last time and it was a buzz to see it featured on his official website, Facebook page, and other bona fide Bowie social media. This time around it's running as a first semester paper in 2019. Get in the Bowie zone, buy your make-up, and enrol now! And remember, as the great man himself said: "If the homework brings you down then we'll throw it on the fire and take the car downtown . . ."
Below are a collection of links to a broad mix of reviews, interviews, promos and other media pieces. I am always happy to talk to media, please get in touch. The Dunedin Sound' is celebrated nationally and internationally as being a unique event in New Zealand’s popular music history. Write On with Vanda Symon, Otago Access Radio. Book Review: Scarfie Flats of Dunedin, North & South. Book Review: Scarfie Flats of Dunedin, Booksellers NZ. From “Toad Hall” to “Shrieking Shack”: new book celebrates flat names, Otago Bulletin. New book celebrates Dunedin's scarfie flats. Newshub. Dunedin's unique student flats. Heritage Matters, Otago Access Radio. Tracing origins of Student flats [extract from Scarfie Flats of Dunedin] / Otago Daily Times, The Weekend Mix, p.11.